Network with fellow students and health professionals. Poster session featuring student-led programming and research projects! 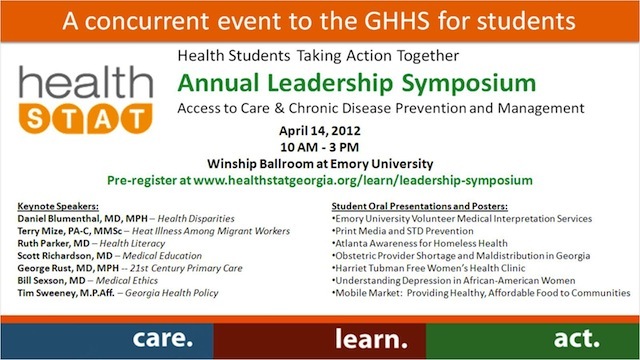 Please visit http://www.healthstatgeorgia.org/learn/leadership-symposium for more information and to register! Health Students Taking Action Together (HealthSTAT) is a 501(c)3 founded in 2001 by medical students at Emory and Morehouse and has grown through the years to include students from public health, nursing, business, pharmacy, PA, and PT from throughout Georgia. HealthSTAT builds healthcare leaders who are engaged in their community, and who recognize care happens outside clinics, and learning outside classrooms. We do this through hands-on service, education, and advocacy in Georgia.